I'm fine with the costume itself, but... yeesh! That makeup makes me look like a demented owl! I really shouldn't do makeup on myself. See, here's the thing about Maha; she's both cute and freaky at the same time. And that, folks, is why I wanted to cosplay as her for NoBrand Con 2006. I had originally planned the costume for Anime Central 2006, back when I wasn't planning on going to NoBrand because I thought it was the same weekend as Ring Game. But when I found out that I was actually free that weekend and that the foam sword guy was going to be there again to hold a tourny, well, I just couldn't stay away. And naturally, being the rabid cosplayer that I am, I simply had to move up the timetable on Maha. I had already done some work on the costume before I had decided on going to NoBrand. The hat had been finished for some time. It was made of felt and pellon interfacing and had the cat ears sewn into the seams and made of some scraps of purple, white, and black cotton I had hanging around. Other than the ears, it was a very simple wizard hat. As Jack Barker would say, pointy hats are status, baby! The clothing part of the costume was amazingly simple. Some loose, capri length pants, a long-sleeved t-shirt with some cuffs made of the same felt as the hat, a tabard sewn together at the side with armholes and split up the middle, a very simple shape for a collar with a draw string around the neck hole, and a belt made of the felt with a sliding cuff to go over the velcroed together ends and clean it up. The clothing itself was all made of cotton (despite the fact that it is oddly hard to find more than one shade of grey cotton these days), so it was even comfortable to wear. I made the shoes myself out of more of the felt. But I can't take credit for the method. 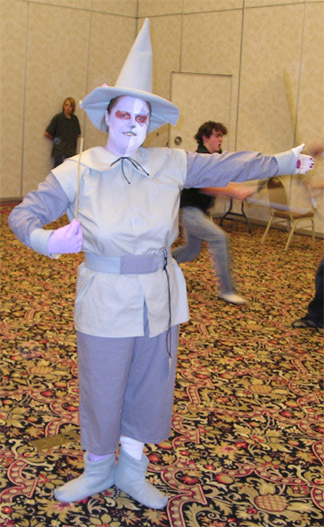 I was pointed to a boot tutorial on the Strange Land Costumes website. Thanks must go out, once again, to my friend Stacey for pointing me in the right direction. Getting my ankles to be the right colors was an interesting endeavor. My first thought was to find pairs of white and purple knee-highs and just wear one on each leg. The white knee-highs were easy enough to find, but I hit a snag trying to find purple ones. With only a few days to the convention and no time to order over the internet, I ended up running all over the west side of Madison, looking for purple knee-highs. I even would have settled for purple tights and just worn them funny. JC Penny, Target, Kohl's, Shopko, Marshall's, Hot Topic, and a myriad of other, more high-class places turned up nothing. I eventually resolved to get the largest white cotton socks I could find and some purple fabric dye. Finally, getting some of my make-up supplies, I stopped by Walgreens and BOOM! There was some vaguely purple knee-highs labled as "dark grey." I figured, good enough. Figures. All over Madison, stopping at all the best department stores and then some and where do I find what I'm looking for? Walgreen's. I still dyed a pair of the white socks as backup, though, along with the one glove I needed for my right hand. In the end, I'm glad I did it that way since it meant that the hand and the sock matched a bit better. By the time of the convention, I still had to finish the shoes. I still had the hand-sewing of the soles to do. A couple hours in the hotel room and that was done and done. It was about then that I decided to give the cosplay contest a whirl. The NoBrand cosplay contest is... er... well... notoriously badly organized. I've never been happy with the way it's been run and I know for a fact that I am very much not alone. But really, it's all for the fun of it and it's really nothing to get your shorts into a bundle about. It would just be nice not to lose to a dog dressed in crepe paper, is all. I spent a good deal of time hanging out with the other foam fighters on Saturday and I kept showing up in different costumes (including Hadoriel and Arlicchina). When I showed up to watch the third qualifiers as Maha, I was finally given the tournament name "Sarah of the Many Faces." Eight eventually qualified for the finals which was set up as a warlord tournament. What that meant was that the quarter-finals were one-one-one, but the winner of the quarter-finals became the team leader with his or her vanquished opponent as a team mate for the two-on-two semi-finals. The vanquished two would then join the victorious two for the four-on-four finals. Now, I am not a full melee fighter. I've done a little bit of fox-and-hound in rapier practice, but that's really it. I was able to apply a few principles I had learned in fox-and-hound to the two-on-two battles and make it to the finals, but the four-on-four was just beyond my skill. If we had had a bit more space than the room we were in, I might have been able to make the same tactics work, but close-quarters chaos like that? Nope, I pretty much got owned, especially when we did "defend the queen" for the last fight. Sword Guy had done some scheming, though. He managed to finagle eight prizes out of the NoBrand Con staff, so everyone who made it to the finals got a prize. He explained to me later as things were being cleaned up that it was because he really wanted to run three tournaments instead of one, but that it was easier to finagle prizes for one tournament than for three. So really, he envisioned the three qualifiers as the tournaments and the finals as an invitational. That was pretty cool. In any case, it was a lot of fun getting to see everyone I had dueled against a couple years ago and we all had a lot of fun beating the stuffing out of each other. I look forward to hanging out with the guys again. Oh yeah, and I saw that odd pink ninja again. What's up with her, anyway? Click here for pictures of costumers! Click here for pictures from the IBS sword tournament! Return to The Cosplaying Adventures of Berzerker_prime! This page created on 4/26/06 by Berzerker_prime.